For beyond-the-horizon communication, it is necessary for the signal waves to travel a large distance. 10 KHz signals cannot be radiated efficiently because of the antenna size. The high energy signal waves (1GHz − 1000 GHz) penetrate the ionosphere. 10 MHz frequencies get reflected easily from the ionosphere. Hence, signal waves of such frequencies are suitable for beyond-the-horizon communication. Owing to its high frequency, an ultra high frequency (UHF) wave can neither travel along the trajectory of the ground nor can it get reflected by the ionosphere. The signals having UHF are propagated through line-of-sight communication, which is nothing but space wave propagation. A digital signal uses the binary (0 and 1) system for transferring message signals. Such a system cannot utilise the decimal system (which corresponds to analogue signals). Digital signals represent discontinuous values. Line-of-sight communication means that there is no physical obstruction between the transmitter and the receiver. In such communications it is not necessary for the transmitting and receiving antennas to be at the same height. A modulating signal is a square wave, as shown in Fig. 15.14. 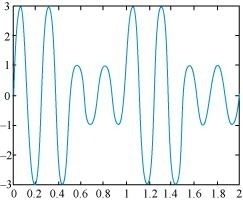 The amplitude modulated waveform of the modulating signal is shown in the following figure. Let ωc and ωs be the respective frequencies of the carrier and signal waves. At the receiving station, the low-pass filter allows only high frequency signals to pass through it. It obstructs the low frequency signal ωs. Thus, at the receiving station, one can record the modulating signal , which is the signal frequency. How to draw AM wave in question 6? How to take values on axis?